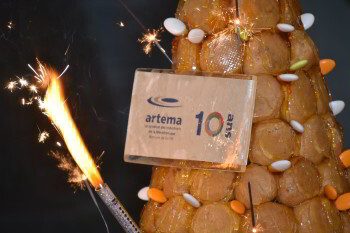 Home » cetop - News » Happy 10th birthday to Artema! Happy 10th birthday to Artema! Artema : the French Mechatronic Industries Association has celebrated his 10th year of its creation on october the first ; this year. On the 1st of october 2007, Artema was created by the merger of three trade associations : MHP (High precision mechanics), UNITRAM (mechanical drives) and UNITOP (fluid power). Since fasteners and mechatronics of course, joined the association. Nowadays, Artema is representing 9 professionals groups : bearings and linear motion, chains and transmission elements, fasteners, gears and gearboxes, hydraulics (mobile and industrial), pneumatics and automation, sealing technologies and mechatronics. Artema has 150 members, 8 partners (technological, academics). Artema is also one of the principal member of FIM (Federation of Mechanical Engineering Industries), EIFI (European Industrial Fasteners Industries), EUROTRANS (mechanical drives), FEBMA (bearings) and CETOP.